Fam, created by Corinne Kingsbury (The Newsroom, Back in the Game) is one of the strangest new TV shows of the 2018-2019 season, particularly when it comes to figuring out what the series is trying to accomplish, or even who it’s for. At first glance, the answers are “laughs” and “millions of viewers,” respectively. 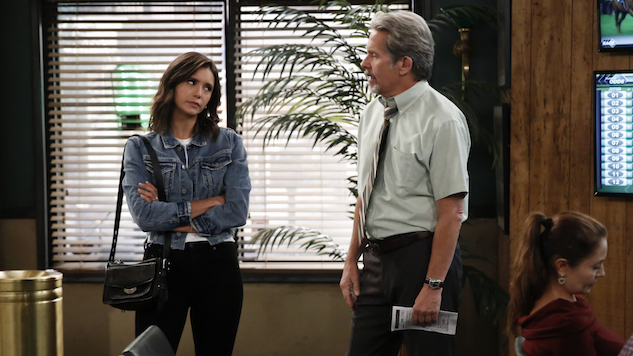 But Fam’s execution of its premise—in which, per CBS, “Clem (Nina Dobrev), a woman whose vision of a perfect life with her adoring fiance, Nick (Tone Bell), and his wonderful family is radically altered when her 16-year-old, out-of-control half-sister, Shannon (Odessa Adlon), unexpectedly comes to live with them”—is where the strangeness comes from. Specifically, the series frames the existence of Clem’s half-sister, and the broken-home backstory that comes with her, as a comic scenario, and not the traumatic situation it is. That’s not to say comedy can’t come out of broken homes and working-class backgrounds: On Showtime, for instance, there’s (the much darker) Shameless, and on CBS itself, Mom captures the lows of such tough circumstances while also being the network’s funniest show. Then there’s the work of Greg Garcia, whose My Name Is Earl and Raising Hope managed to tell genuinely funny and emotionally affecting stories because of their situation within difficult socioeconomic conditions—not in spite of it. In these series, the joke isn’t on the characters for being working class or disadvantaged or screwed over by life; in Fam, that’s often the only joke. Fam mostly assumes the perspective that it’s hilarious Clem and Shannon’s father, Freddy (Gary Cole) hurt them so badly that Clem has lied to Nick and her future in-laws about Freddy being dead, like her mother. (Nowhere in the three episodes made available to critics does the series provide a good enough reason why Shannon doesn’t live with her still-living mother, other than the fact that she doesn’t want to move from New York City to Phoenix.) In Fam, it’s “funny” that Freddy gave Clem cigars to smoke when she was 11. It’s “funny” that Freddy wouldn’t let Clem take ballet when she was six because “My daughter ain’t gonna be no stripper.” There’s something to be said about not taking a TV show too seriously, but mere seconds after meeting Freddy in the pilot episode, I wondered if Child Protective Services would ever come up, of if they were saving it for a finale cliffhanger. Then, in the second episode, Fam features a joke about Freddy taking the woman from CPS who came to check on Clem to Mexico. Because it’s “funny” that the system failed Clem and is now failing her sister, who is a high-school dropout at the beginning of the series. Because it’s “funny” that Freddy doesn’t care. Fam’s fundamental problem, then, comes in the form of Freddy, and how it approaches the entire family dynamic as a result. Freddy defends his poor parenting as a response to Clem’s mother’s death, but it’s not framed as the failure of a grief-stricken widower; instead, it’s written as, “I knew I was no good, so instead of half-assing it, I zero-assed it.” Though Cole delivers the series’ best performance, Freddy is its weak link: the type of dirtbag parent who returns during May sweeps, made into a series regular. (In fact, Cole already played that role on Chuck, as Sarah’s con artist father.) Freddy is the broadcast TV version of Shameless patriarch Frank Gallagher, minus the understanding that Frank outlasted his expiration date years ago or Shameless’ acknowledgement that things are so fucked for the Gallagher “kids” that their fate can’t be the main source of its comedy. At its worst, then, Fam like watching a horror show that somehow got a live studio audience. There are bright spots. Fam shows real strength, even this early on, at building on its jokes throughout the entire episode, and though the jokes themselves aren’t always the best, the joke structure is. For all of Freddy’s flaws, he does give us one of the most important moments in television history: Gary Cole rapping “Baby Got Back.” And with a 16-year-old character in the mix, the idea of Dobrev and Bell—who have terrific chemistry and comic timing—being old and out of touch makes at least some sense. It even leads to the best joke—with a punchline and everything—of the first three episodes, about Clem’s “young mom in a minivan” style. In fact, despite its near-complete absense from the rest of the series, Fam (mercifully) displays a modicum of self-awareness when it comes to Clem and Nick’s relationship, as well as their role as Shannon’s new parent figures. It also helps that—as much as Shannon’s character reflects what middle-aged writers think teens are like these days—Odessa Adlon is pretty great here, even if it can be distractingly apparent that she’s Pamela Adlon’s daughter. There’s a better story already present in Fam, about Clem and Nick as new, de facto parents to an unruly 16-year-old, which could just as easily be told with Freddy out of the picture. In fact, the best episode of those screened for critics is the one that excises Freddy completely, and focuses instead on Clem and Nick as new parents who want to keep their romance alive, and on Shannon as a kid who sincerely wants to give this whole situation a fair try. This might be the strangest—and most disappointing—thing about Fam, and about Freddy’s undue prominence within it: It’s a technically proficient, otherwise promising sitcom that wastes these merits on the disastrous decision to let trauma become the driving force of its comedy.